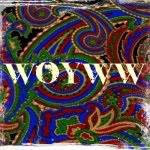 CraftygasheadZo: WOYWW 359 - stickers! Hello everyone - apologies for my blog quietness. I promise I'm making up for the silence in usual Zoe chatterbox-style! 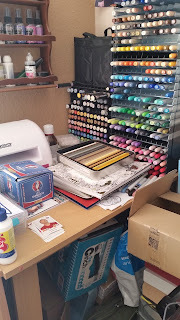 Today I'm here to share my desk as per many over at Julia's Stamping Ground why not pop by and join in? 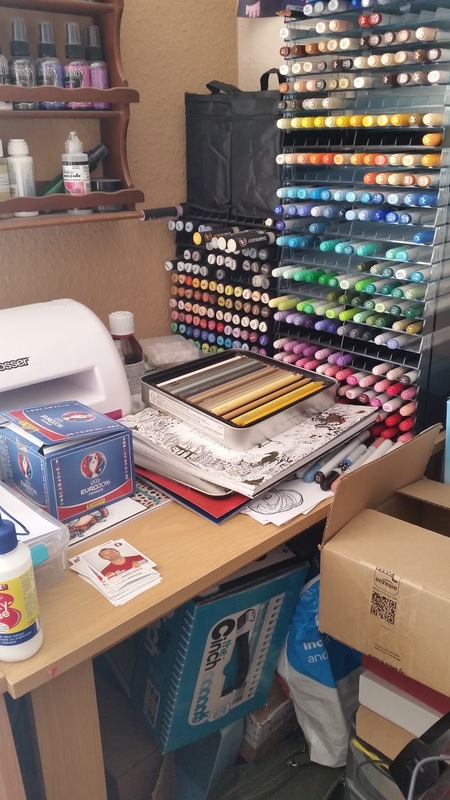 Right hand side looking untidy - there's my Prismapencils & colouring book, lots of boxes under desk and a box of Euro 2016 stickers. Window side is a bit sparse. The sun is shining beautifully this morning. 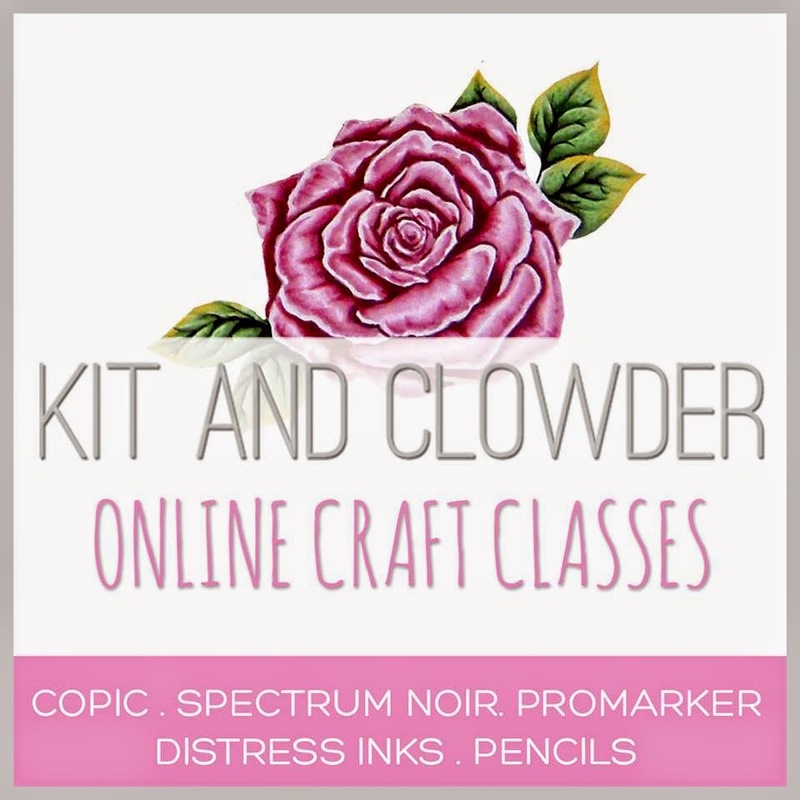 You can see my planner in the window as well as my Cinch machine. 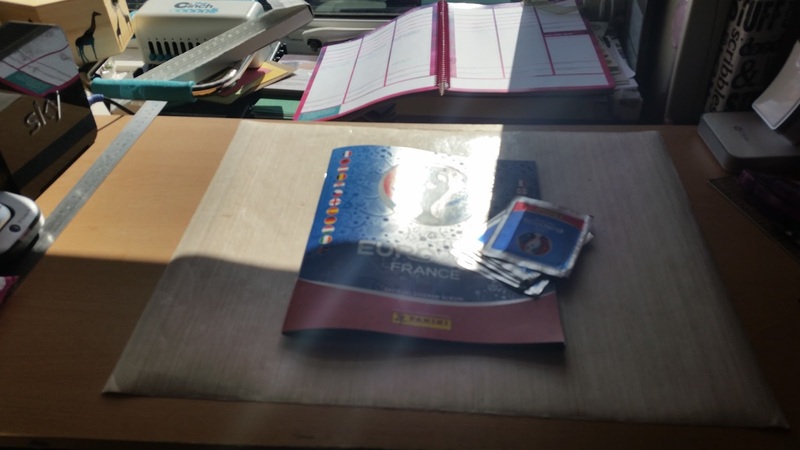 On my desk is the Euro 2016 sticker album. 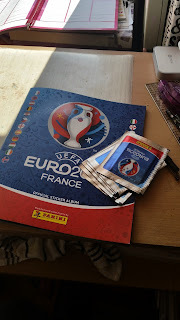 Yep I decided to go with my inner child and collect football stickers for this Summer's Euro's in France. It worked out cheaper to buy a box of sticker packets than to keep buying odd ones. I'm fighting the urge to stick them all in one go! I'm just grabbing a few packets each day and am thoroughly enjoying the process. There you go. Not crafting as such but it is sticking!! I've been grabbing the inner child too but mine was in planting a seed in a CD case and doing a Mr Grass head (there are links on my post today) What are we like? BJ #17 , please ignore the first two attempts at linking via my tablet at #16 & #4, I was obviously far too excited this morning! Oh, I understand completely! There is something incredibly satisfying about collecting and filling in a sticker card book like that. I saw that Bristol Rovers drew last night, are they still on target for promotion? My grandson is collecting the stickers for the same sticker album also. Grandad is cutting out the coupon everyday & getting the free sticker sheet from the shop on the way home each night , so that's one happy grandson at the moment. Hi Zo am smiling here at you grabbing a sticker book and filling it in ,.. something very satisfying about that isn't there? Lovely desky share, had good snoop1 I like your sprays in your spice shelves assume that is what they were.. I'm doing a lunchtime whizz round all my fav blogs having had a busy morning shortening trousers and a very posh long dress in the sunshine.....what more could a girl wish for? Your art area is fabulous, Zoe! I totally understand the appeal of the stickers--we actually have a sports card and memorabilia store, and have for almost 30 years now. We're in the US, though, so I haven't seen your stickers before. It's great to just have fun now and then, enjoy your sticking! Hi Zo, I am so envious of all your lovely pens. I saw the sticker album in Tescos this morning. I remember those sticker books when we were kids. Used to love collecting the football ones. What a blast from the past! Your desk looks wonderful - all those pens just make my jaw drop in wonder. Have fun with your sticker collecting! Thanks for calling in earlier. I'm not a foorball fan but one of our grandchildren is into football and has albums too. (Perhaps even the one you have). And I can understand the fun of doing it. So have fun! You've just taken me back to my childhood too! I remember the wonderfully satisfying feeling when you got the sticker you needed and added it to your book - it was addictive! Hope you have loads of fun filling yours in, but it's cheating a bit if you don't do swapsies!!! Enjoy your football stickers. First of all thanks for visiting me yesterday whilst I was out and about. Love your desk and all those pens - if I could colour as good as you I would also be having lots of pens to use. 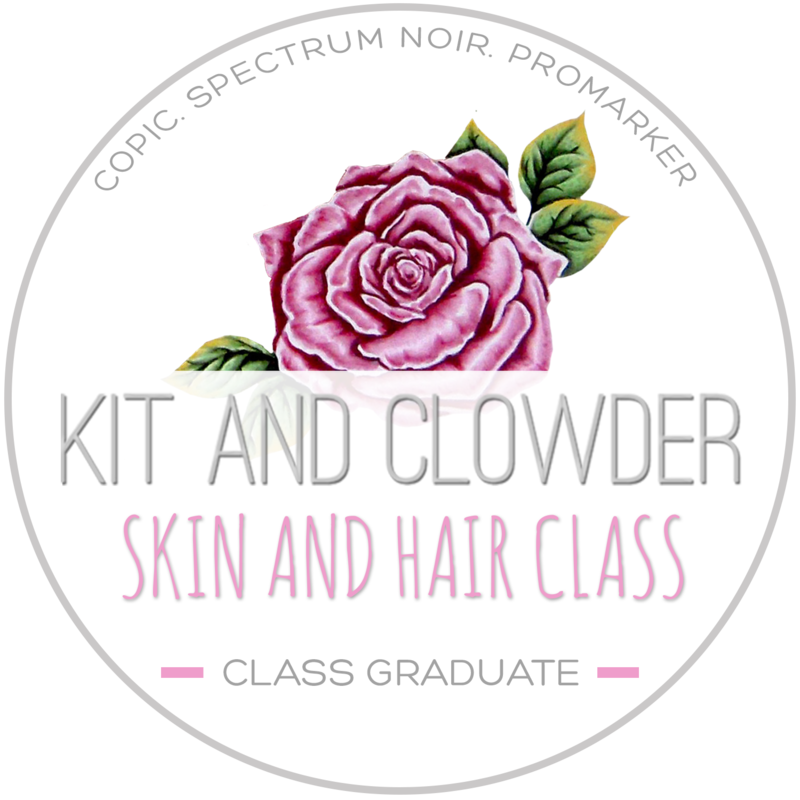 I think all crafters enjoy a collection of stickers. Those beautifully arranged coloured markers are a visual delight. Your collection of markers is awesome! I fall for stuff like that. Re you going to swap stickers? I love your desk, it really seems rather organized on the right with the markers and forward with the shelves of goodies. Have fun with your sticker collection! Thanks for your visit and hope your weekend is great! I have to apologize, because I'm coveting your book binding machine, but especially your amazing marker collection and storage unit. Just kidding, but I would seriously love to have that many choices. Anyway, thanks for your visit and have a very blessed week! Love all your coloured pens at the side! Zo, what a lot of pens and pencils you have, and so organised. I assume you do lots of colouring, not my forte. Thanks for visiting my desk. Thanks for your visit earlier - Floated my boat in Tuileries, it all happens on Sundays!!! Glad you're bringing out the inner child as well, smashing fun isn't it?